Managing water resources effectively is one of India’s prime concerns today. 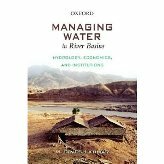 This book provides an in-depth analysis of existing methods of water management and highlights the gaps in the use of water in various river basins. Underlying the futility of ‘quick fix’ solutions, it puts forward various alternative strategies for water management. Using illustrative case studies, the author lists major challenges in water management—productivity improvement in key-use sectors, inter-sectoral allocation, trans-boundary resource management, and availability in deficient regions. Highlighting the opportunities for improving water productivity in agriculture, he also provides methodologies for generating country- and regional-level water balance scenarios. The volume also discusses the problems involved in allocating water in river basins. Kumar gives a detailed account of some of the widely known economic tools. He examines the institutional and policy measures for ensuring sustainable use of water and economic growth, including the creation of new organizations.